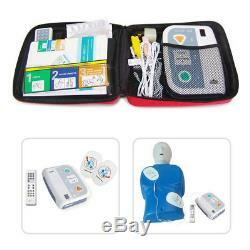 2X AED Trainer First Aid Training Teaching Kit Student Emergency Train XFT-120C+. There are 20 languages for you to choose 2 languages. English, French, German,ish, Italian, Polish, German, Portuguese, Greek language. Swedish language, Finnish, Dutch, Hungarian, Russian, Japanese, Croatian, Korean and so on. 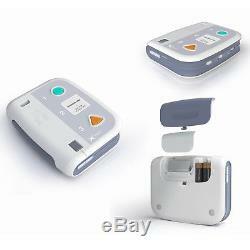 AED trainer XFT-120C+ is designed to effectively. In the use of a clinical AED. This training unit provides a variety of pre-programmed scenarios. Familiar with the AED and allow the to demostrate the basic skills. Necessary to use the AED in an emergency. Can be used with any kind of manikin. It has the analog electric shock function. But it does not provide high voltage, to ensure the safety of the use of the process. It simulates the real AED to analyse whether the electrode truly connect on the patients body. It preset 10 training modes. Each mode is simulate the real situation of the heart sudden cessation events. It is completely compliant with the latest AHA guidelines. And pre-configured with 10 training scenarios that simulate realistic sudden cardiac arrest episodes. 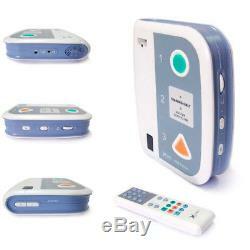 It is designed with a replaceable plug-in card which has been uploaded the languages and scenarios. To insert the card, the selected language and scenarios are installed. Once the Guidelines are changed. Customers only need a new plug-in card to update the scenarios. A metronome is added to the flashing lights when the unit is counting out the 2 minutes for CPR. The sound that prompts 100 compressions per minute helps trainers to properly perform CPR. It can be used with the CPR Manikin. It can respond if the training pads connect firmly or not, can prompt whether the position of the electrode pads is ok. It includes the DC and AUDIO interfaces, the DC interface can connect the adapter. And the AUDIO OUT can connect the speaker, it's very helpful for instructors during teaching etc. There are 16 languages for choice at present. It comes with Remote Control. Which is very convenient for the teachers use in large classroom during teaching. There are FULLY and Semi auto scenarios modes for choice. XFT-120C+ AED Trainer 2 kits. 1 kit contain is as below. GS / UL Standard, DC4.5V/300mAh. USA, United Kingdom, Australia, Canada, France: 7-15 Days. Aisa Countries(near China): 10-20days. South America Countries: 20-35days, some special countries will be longer. But it may take a little longer due to the regional post service difference. We will replace it with a brand new replacement. Thanks for your support on our business and your five-star feedback will be highly appreciated, and we will do the same for you. Please do not leave the negative/Neutral feedback or open a case without any communication, thank you very much! The item "2X AED Trainer First Aid Training Teaching Kit Student Emergency Train XFT-120C+" is in sale since Saturday, May 26, 2018. This item is in the category "Business, Office & Industrial\Medical/Lab Equipment\Medical Equipment & Instruments\Emergency/EMT". The seller is "best2018gogo" and is located in shenzhen. This item can be shipped to North, South, or Latin America, all countries in Europe, all countries in continental Asia, Australia.